Moringa oil removes and prevents wrinkles and prevents sagging facial muscles, makes the face radiant and helps tighten pores. Moringa oil is the most stable oil in nature and practically rancid. The oil extracted from the seeds, full of moisturizing and anti-aging substances, which triumphantly returned to the podium for beauty. They are called Ben oil, due to the isolation of a high concentration of behenic acid. 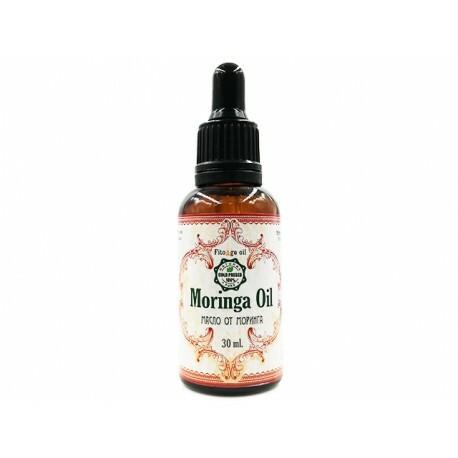 Moringa oil has moisturizing, cleansing and softening properties. It absorbs easily into the skin, improves the appearance and appearance and shine. Moringa oil contains vitamin A, antioxidants and other nutrients that help build up collagen. Its protect against the formation of free radicals that cause damage to the skin and wrinkles. Apply a few drops of butter with your fingertips to the neck, neck, and lip. Continue with massage movements for 2-3 minutes.